While everyone was voting in Colorado elections Tuesday, scant attention was paid to how our U.S. Senators voted on a measure that is extremely important to our entire way of life. We’ll give you a hint … it’s water. A bill by our Wyoming neighbor, Republican U.S. Sen. John Barrasso, would have required the EPA to rewrite the egregious Waters of the United States rule to give states and the agriculture industry more protection. WOTUS, as it’s known, is the latest and worstest regulation issued by the Obama administration to regulate ponds and ditches in neighborhoods and farms as navigable waters, as if it were rivers or the ocean. Barrasso’s measure would have also required more input from local communities, something which liberals and Democrats are always screaming for when it comes to natural resources development. Not so much when it comes to scrutiny of their bureaucratic buddies in the EPA when they essentially pass laws by regulatory fiat. Too bad Barrasso’s bill was killed in a filibuster. U.S. Sen. Michael Bennet voted to kill the measure, while Sen. Cory Gardner voted to support Barrasso’s bill. “It’s disappointing that, once again, a minority in the Senate has blocked a bipartisan measure designed to reduce the growth of the federal government and allow Coloradans more control over their lives and land,” Gardner said. While Bennet has been Tweeting and issuing press releases in recent days about how hard he has been working with the EPA to make sure Coloradans get repaid by the agency for the damage it caused in the Animas River spill, he’s had zip to say about how hard he works with the EPA to give them power over our state’s water. Bennett is just another ordinary Democrat hack. Colorado must dump him in the next election. Hope the Republicans get their act together to field a strong opponent. 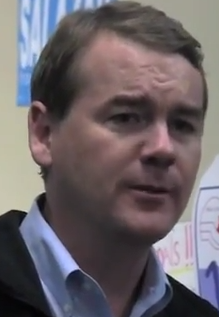 Bennet is incapable of having an independent thought. He is another dem leming determined to vote straight party line.